Description: "As winter begins its slide toward the sunny days of spring, we bring you Glissade Golden Bock to help you enjoy the ride. Glissade is a remarkably mellow take on the traditional spring bock. With restrained sweetness, we emphasize subtle malt flavor, balanced against delicate aromas of spicy and floral European hops. This complex balance helps Glissade slide across the palate—bracing us against the last cold nights of winter, while its bright golden color turns our thoughts toward spring.” — Sierra Nevada Brewing Co.
Random thoughts: Bock is new to me. After a little research, I learned it's a German lager. The sub-styles of Maibock/Helles Bock, Doppelbock, and Eisbock each have stronger malt profiles and higher alcohol contents. Doppel = Double....get it? Bocks tend to emphasize malts over hops. This is part of my series on Spring seasonals. According to Beer Advocate, Glissade is classified as a Maibock/Helles Bock. The tasting: Golden straw in color (ever so slightly hazy) with a huge fluffy white head that dissipated slowly, leaving some lacing on the glass. It has quite a bit of champagne-like effervescence floating to the top. Aroma of bready malt and light lemony citrus hops. Flavor of biscuit malts and spicy hops. Alcohol is noticeable mid-taste. Light to medium bodied. The effervescence is prickly and quite pronounced in mouth feel. It finishes semi-dry. Glissade is highly drinkable and very refreshing, despite the higher alcohol content. Rating: 3 star. Good. I would drink this again if someone gave it to me. 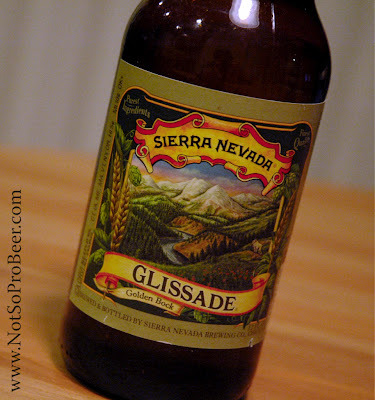 I liked Glissade and thought it was a great introduction to the Bock style. 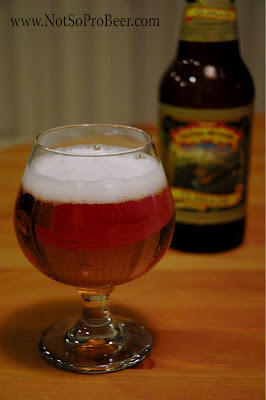 While it has a bready malt aroma similar to a pilsner lager, the flavors are quite different. This would be an ideal beer for summer, in addition to spring. I plan to taste some more Bock beers. Fortunately, I happen to have Anchor's spring Bock seasonal, resting in my fridge. Have you tried Glissade or any other Bock beers? Where did you buy this bock? Supermarket (Fred Meyer). On sale for $1.17.